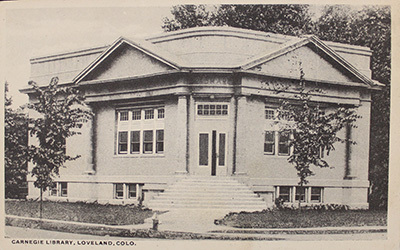 The Loveland Museum/Gallery collects the social, natural and cultural history, and pre-history of Loveland, Colorado. We collect objects that reflect Loveland’s unique development. Objects that place Loveland in a wider historical context are also accepted. The Collection Accession Committee (CAC) is responsible for reviewing potential historical objects for placement in the Museum’s collection. The CAC is made up of Cultural Services Director, Curator of History, Museum Registrar and community members. Objects must have significant relationship to Loveland, Colorado. Objects must have usable exhibition, educational or research value. Objects must be in stable condition. Objects must not be duplicated in the collection. Objects must fill a blank in the present Museum collection. The Museum must be able to provide adequate storage for the object. Objects must be given to the Museum restrictions. Items that reflect the history of surrounding towns/cities. Items that are overly represented in our collection such as typewriters, mangles, pianos, televisions, newspapers, and sewing machines. Hazardous materials such as chemicals, asbestos, and radioactive mineral samples. Illegal items such as eagle feathers or drugs. If you have an item that you would like to donate, please fill out the collection donation form. If you have further questions, please contact our Registrar, Ashley Yager for more information: (970) 962-2461, ashley.yager@cityofloveland.org. *Note: Objects may be removed, or deaccessioned, from the Museum’s collection according to the guidelines set forth in the Museum’s Collections Policy. Thank you for your interest in donating documents, images, or artifacts to the Loveland Museum. To assist us in our review, please fully describe your proposed donation by including information about its size, condition, and historical significance, and attach photographs or photocopies of the materials, if possible. To properly give your items attention and consideration, the Museum holds quarterly committee meetings to review proposed donations. If you are leaving your items in our care during the period before the next meeting, you must sign a “Receipt for Items to Be Considered for Gift”. You will be contacted within one week of the committee’s meeting regarding their decision. If the Museum accepts your donation, and you would still like to transfer ownership of your items to us, please be aware that we require you to sign a second document (“Deed of Gift”) that will be sent to you after the committee has met. Accepted file types: jpg, tiff, png, pdf. If possible, please attach 1 or 2 images (no larger than 2MB each) of the item(s) you wish to donate to the Museum. Images that capture key features or document the condition of the item(s) help the curatorial staff evaluate donation offers (if you are proposing a large volume of papers, books, or images, please provide sample images).